I like to serve a few classic cocktails when entertaining, and that includes a mocktail for guests who choose not to drink alcohol but would prefer a tasty alternative to sparkling water. AERIN’s barware collection includes an elegant selection of trays, glasses, ice buckets, and coaster sets to create your own bar at home. Made with lemon juice and sparkling tonic water in lieu of gin, and a touch of citrus bitters, this mocktail is a good alternative to Champagne. Add fresh lemon juice and bitters to cocktail shaker filled with ice. Shake until frosty then divide into two Champagne flutes or coupe glasses. Top off with tonic water until it reaches about ¾ of the way up the glass. Garnish with the swizzle sticks (alternatively add 1 tsp. of superfine sugar) and serve immediately. Apple and ginger are tastes I love. 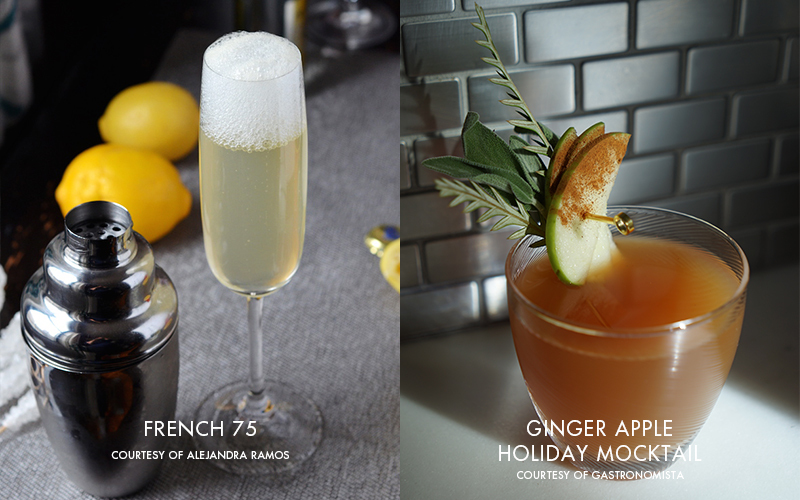 Combined, they create a delicious drink for party season. Build in a lowball glass over ice. Garnish with thinly sliced apple slices dusted with cinnamon and a leaf or two of fresh sage.